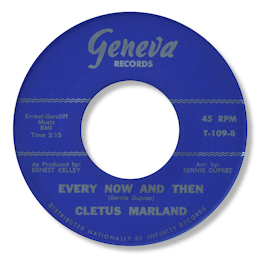 Cletus Marland came from Pittsburgh, PA and cut his first records around 1960/1 for local record man Odell Bailey. 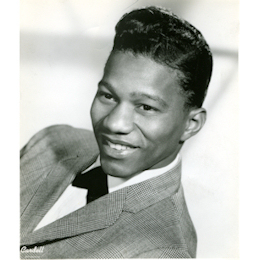 The rare Bevmar release has a decent doo wop styled ballad in “Be My Love” and the 45 leased out to New York’s Roulette – which sounds like it was cut at the same session – has the similarly styled “I’ll Take Care Of You”. But for his later, and better music, he was in the charge of Detroit producer Ernest Kelley, who cut him in the Big Apple. The first tracks released from these sessions coupled the Northern “Every Now And Then” with the super downbeat Keep On A Loving which features some nice chord changes and an enthusiastic female chorus. Kelley didn’t release other songs from the 1965 sessions until the 80s when he reactivated his Terry label for the pleasantly tuneful “You’re Gonna Miss Me” with the fine deep ballad Yesterday on which Marland undoubtedly gives his very best vocal performance. The girl group are a little further down in the mix on this one and the horns more prominent which helps. Like almost all of his tracks this one was written by Pittsburgh writer Bernie Dupree – a special nod of thanks to him. And until Grapevine 2000 released their “Kelley’s Soul Heroes” CD that was thought to be all of Marland’s recordings. But there was one ace up his sleeve, the superb I Wish That You Were Here which is a version of Kip Anderson’s magical “A Letter From My Darling”. Now this track was released in 1968 so either Marland had another session with Kelley after this date or he cut the first version of this classic ballad. In any case Marland is excellent here, more gritty and soulful than on other tracks, and the band give him high class support. Maybe not quite up to the emotional depth that Anderson achieved but pretty close. 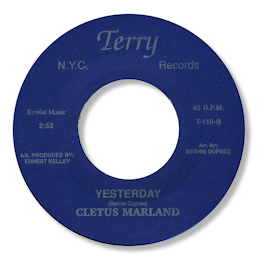 Cletus Marland apparently moved to the West Coast where he is reported to have passed on. 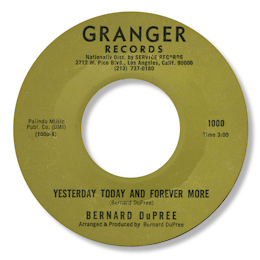 UPDATE ~ Dave Turner writes to point out that the Bernard Dupree 45 on Granger ("You're Gonna Miss Me") is the same as the Cletus Marland issue. The flip "Yesterday" is the same song but a slighly different mix. This very interesting bit of info prompts the thought that as Granger was a West Coast label, and that is where Marland is reported to have ended up, could he and Dupree be one and the same person? Thanks to Dave for the excellent spot. FURTHER UPDATE ~ I can now confirm that Bernard Dupree is indeed the same guy as Cletus Marland. I have also updated the discography to show the Wink 45 second issue of Marland's first 45. Note ~ You can find "Every now and then", "I wish that you were here" and "You're gonna miss me" on the UK Grapevine 2000 CD "Kelley's Soul Heroes". Thanks to Dave Porter for the excellent pic of Cletus.